B. EQUIPMENT AND PERSONNEL NEEDED FOR VISUAL CONTROL. C. VISUAL AIR CONTROL PROCEDURE. (a) Saturation of radar by land echoes. (b) Enemy planes below radar horizon. (t?) Enemy planes inside minimum range of radar cover. (d) Enemy countermeasures render radars useless. (e) Radar equipment suffers material failure. (f) Too many friendly planes make visual recognition necessary. Visual air control stations are no longer being instrumented in new construction. However, existing facilities should possess the largest practical plotting table with gyro repeater in the center for rapid conversion from relative to true bearing and vice versa. VHF/UHF radio outlets, including a remote control unit for changing channels, should be installed in the visual control center. It is suggested that a throat-microphone or a new type aircraft lip microphone be used with the keying button mounted on the controller's binoculars. Binoculars, size 7 x 50, should be provided for all lookouts and the controller. A telescope may be used as a substitute or to complement one pair of binoculars. Sound-powered phone connections to the following stations are necessary: (a) bridge, (b) • CIC, (c) lookouts (d) such battery control stations as necessary to insure close coordina-tion of ship's gun fire with the tactics of the intercept and safety of friendy fighters. (a) Visual controller, using the appropriate VHF channel to direct any aircraft under his control. times and making a running commentary on the target's movements. (c) Enlisted talker to serve as friendly tracker to keep the visual controller informed as to the position of his own VF at all times. (d) Enlisted plotter on the JS or appropriate radar reporting circuit. The vocabulary and tactics used in directing aircraft under visual control follow the standard form of air control very closely. However, the time element makes certain modifications necessary. The standard call-sign for all visual control stations is "SNAP." If the designation of the ship is MOHAWK, the visual station will be "MOHAWK SNAP." The fighters continue to use their normal call signs. On initial transmission, full call signs should be used. For subsequent transmissions, however, the SNAP can be omitted, and if no confusion results, the fighter call sign can also be omitted. Because of the fact that compliance or noncompliance with any orders can be observed visually, no "wilcos" are necessary from the pilot. This saves time and keeps the circuit free for the visual controller to put out information. All pilots flying aircraft controlled by the visual controller should fly at top speed during interceptions and make all turns hard turns. The time factor does not allow for the changing of speeds or the controlling of turns. The SNAP-controlled plane or planes should be stationed tactically to give the best maximum visibility or to combat the latest enemy tactics. The initial vector for a visually controlled fighter may be one of two types; the magnetic vector, in which the plane will fly a magnetic heading, or an informative heading, in which the pilot is informed the bogey is closing over a known point of land, the parent ship, or the like. The initial vector may be started at a level altitude, in which the fighter flies at the altitude at which he is stationed, or a PRONTO vector, meaning to "dive down as low as possible and go out on the vector indicated"; (i.e., "Vector pronto one-three-zero"). After the initial vector, control of the interception becomes a problem of relative movement. Port or starboard turns of a specified number of degrees are not advisable. The pilot must be searching for the bogey so it is impossible for him to watch his compass. A port or starboard from the visual controller with a "STEADY" when the plane is on proper heading is sufficient for control. An altitude advantage for a fighter intercepting a bogey low on the water is not desirable; the lower the fighter, the greater his visibility. More information can be given to the fighters in visual intercept work than can be given during radar interceptions; i.e., the exact number of planes, a more accurate altitude, and the type of planes that are being intercepted. The same information given the fighters in radar interceptions is given in visual work. The bogey's height, course, and if crossing or closing, etc., should be given to the friendly planes. 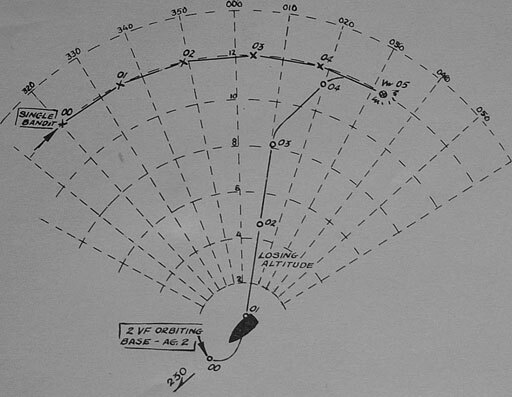 Clock-code positions and distances of the bogey from the fighters should be given at frequent intervals and as accurately as it is possible to estimate. Also, information as to how bogey is closing the friendly--"Closing head-on," "crossing port to starboard,"--etc., is very necessary. All transmissions to the visually controlled plane(s) should end with "OUT". It is not necessary for the pilot to acknowledge or wilco any transmission since visual contact will tell immediately whether or not he is complying with the order. Continue Starboard--"Continue turning to port (starboard) at present rate of turn until instructed to straighten out,"
B. Up--"Climb number of feet indicated." C. Down--"Descend number of feet indicated." F. Tally-ho Punch--"I see the enemy aircraft and can get him before he reaches effective AA range." G. Tally-Ho--Heade Up--"I see the aircraft but am not able to intercept before he reaches AA range." H. Masthead or On the Water--"Fly at sea level (may be used to indicate target is at sea level)." The control of a visual plane or planes must be absolute, i.e., the plane should not be a part of the regular CAP and switched to SNAP control when the bogey has closed to visual range. Time will not permit the breaking off of sections of the regular CAP or shifting frequencies when enemy planes are spotted close aboard. Passing control of the fighters from ship to ship should be resorted to only in the case of emergency. 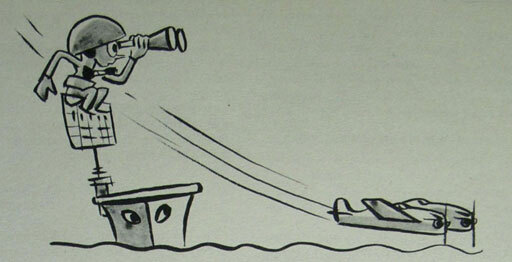 There can be no loose arrangement whereby one ship, spotting a bogey, can grab control. where the target is low on the water. Third, as already indicated, acknowledgments by pilots under visual control are not necessary. For the most part, visual fighter direction is useful against low-flying aircraft. If targets are high, the radars should pick them up and permit normal radar control to prevail. Visual control may also be used at close ranges for a variety of other routine activities, including traffic control in carrier landings.